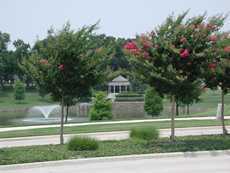 The Crape Myrtle Trails, McKinney, Texas. When you drive through McKinney, you can’t help but notice the natural beauty that is a part of the city. It seems so harmonious, it takes a few minutes to realize that a large part of what makes the drive so aesthetically pleasing is a relative newcomer to the scene. But on closer look, visitors realize they’re seeing crape myrtles everywhere. And at this time of year, they’re just now popping out into full bloom. From peaceful whites to romantic lavenders to bold pinks and reds, these Lagerstroemia offer something for everyone. 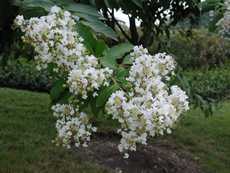 They range in height from dwarf shrubs, with a height of three feet or less, to medium sized trees with heights up to 30 feet. They have the traditional multi-stem trunks and the less common single stem trunks. 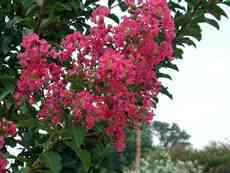 They are planted alone, in groups and with other plants that only serve to enhance their appeal. Hot pink Crape Myrtle bloom. City leaders aren’t alone. “The community loves this project. They want to get more involved and they want to know how to get more involved,” says Susan Owens, Executive Director of the Crape Myrtle Trails of McKinney Foundation. The foundation was formed in 1998. The driving force behind the ongoing beautification effort is Neil Sperry, former Dallas County Agriculture Extension Agent best known today for dispensing horticulture advice through his radio show, broadcast on KRLD and the more than 60 radio stations that are part of the Texas State Network. Over the last four years the city has planted more than 2,000 crape myrtles along more than 10 miles of public roadways, primarily on El Dorado Parkway, Virginia Parkway, Highway 380 and all the way through the Stonebridge Ranch Subdivision. Owens says the next phase of planting will run from Highway 75 west on Virginia Parkway to the beginning of Stonebridge Ranch. 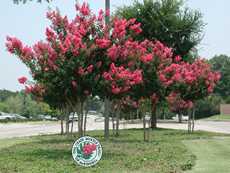 She adds that the plantings in the Stonebridge Ranch subdivision are particularly beautiful, because the developers immediately embraced the vision of a citywide crape myrtle trail.